A bus operator is facing charges after 12 people were injured when a bus collided with Montague St bridge in South Melbourne. 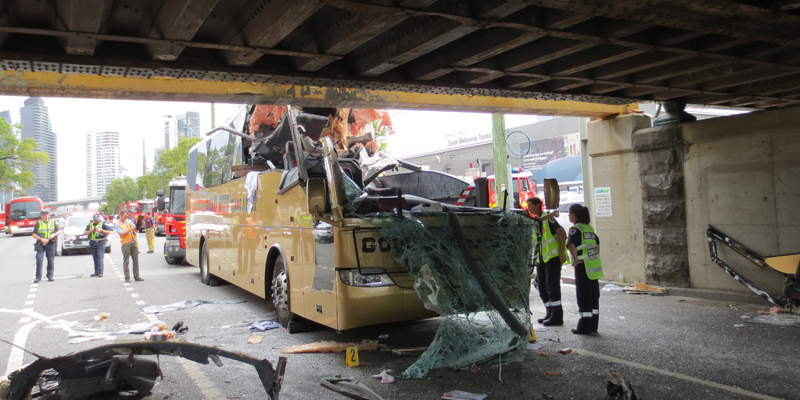 The 3.8 m high charter bus crashed into the bridge, which has a clearance of 3 m, on 22 February 2016. The bus driver and 11 passengers were taken to hospital. Four suffered extensive injuries – one suffered broken bones, and another spent three days in intensive care. The bus operator, Bacchus Marsh Coaches Pty Ltd, trades under the business names of Gold Bus and Bacchus Marsh Coaches. It has been accredited since 1999, being most recently re-accredited in November 2015. State regulator Transport Safety Victoria (TSV) has today charged the company and two of its officers with breaching section 15 and 69 of the Bus Safety Act 2009. TSV alleges that those accused knew, or ought reasonably to have known, about the risk posed by low clearance bridges and available means to eliminate or reduce this risk. Section 15 of the Act requires that an operator of a bus service must ensure the safety of its bus service, by eliminating or reducing risks to safety so far as is reasonably practicable. Section 69 of the Act provides that: If a body corporate commits an offence … an officer of the body corporate also commits an offence against the provision if the officer failed to exercise due diligence to prevent the commission of the offence by the body corporate. Since the 2016 incident, the accused company has made efforts to mitigate the risk posed by low clearance bridges. TSV alleges that many of the measures taken were available and could have been implemented by the company prior to the collision. The maximum penalty in this case is $285,426 for individuals, and $1,427,130 for the company. The filing hearing at the Magistrates’ Court is set down for 17 October 2017.